Children and Make Up – Try it Safely with a Pamper Party! Research recently conducted indicates that many children throughout the world are using make up at an earlier age than in years gone by. We are all familiar with the feeling that our girls are growing up much faster than we did! So, how safe are the beauty products that your children use? At Pamper Me Girls, we know how important it is to keep an eye on the make up and beauty products your daughter uses. Young skin is delicate, so natural products are best. This is particularly important with beauty products such as moisturisers and foundation – liquid products that are applied to a large area of skin. Eyes are delicate too, and it’s important to explain to girls that they should not share make up with friends. A safe way for children to try make up for the first time is at a pamper party. Pamper Me Girls pampering parties are a popular and safe way for young girls to try out make up, manicures and hairstyles. We supply a trained beautician who can show the girls how to apply make up and choose the right products, whilst making them feel grown up and beautiful! All of our beauticians are trained to work with children and teenagers. This means being CRB-checked as well as fully qualified in the treatments they provide. The idea of a pamper party is that the beautician will bring the spa to you, providing safe-to-skin beauty products for the girls to try. 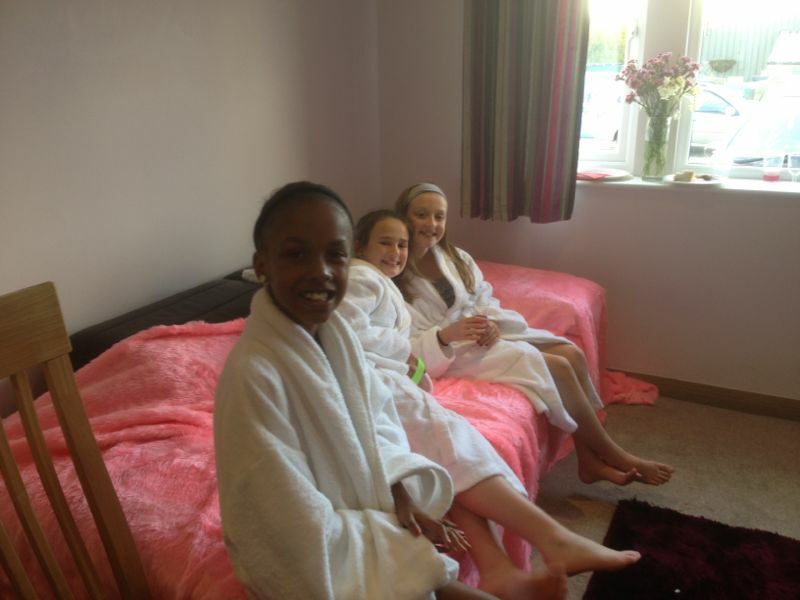 They can also bring extras such as foot spas and gowns to make the girls feel extra-special. Girls are growing up faster these days and it’s impossible to stop them experimenting! However, you can make sure that they are trying out products that are not damaging to their skin by doing a little research. And try not to laugh when they show you their first makeover attempts! To find out more about Leeds children’s parties visit the Pamper Me Girls website. The fully-trained beauticians will be able to explain all of the products they are using and will ensure that makeovers are age-appropriate. Pamper parties are a safe way for girls to try make up for the first time and experiment with their friends. 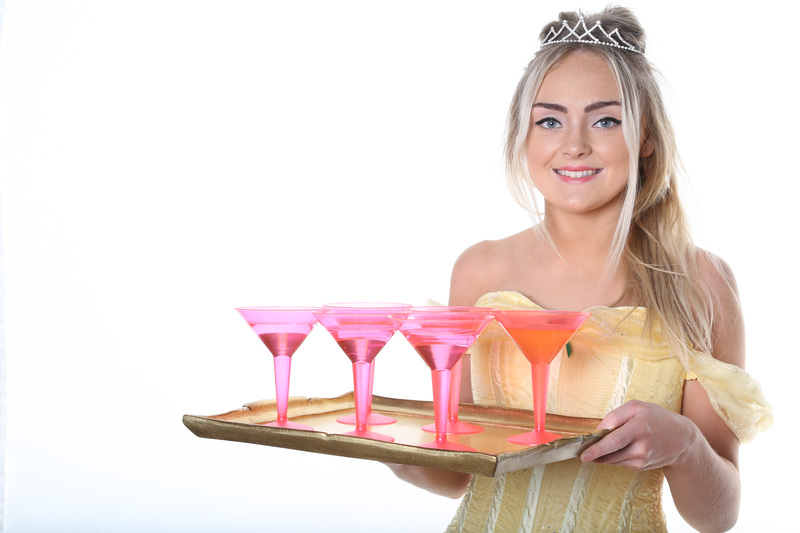 Ideal too, for teenage parties, prom nights and princess parties! Pamper Me UK are based in Leeds, Yorkshire. The girls love posing after their makeovers! Are you looking for something a bit different for your daughter’s next birthday? Or maybe it’s that all-important Sweet 16 or a celebration of exam results. 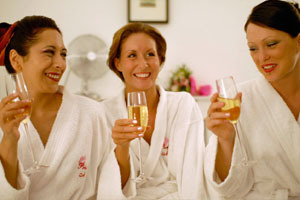 Then you need to check out the latest trend in pampering parties with Pamper Me Girls. Pampering parties cater for a range of ages from four upwards and we also offer parties tailored specifically towards older girls and adults too at our Pamper Me UK website. 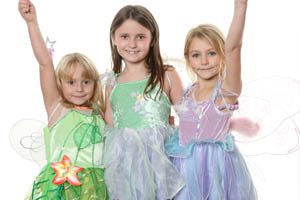 For the younger girls, why not set a princess or fairy theme? Guests can arrive in their favourite princess outfit or you could set up a magical dressing up box containing every outfit and accessory a princess could possibly need from tiaras to wands, hairbands, jewellery and anything with a bit of sparkle. Once everyone is dressed to the nines, the fun really starts. With a Pamper Me Girls pampering party, trained beauticians offer services such as princess mini glitter manicures, glitter age appropriate makeup, glitter hairspray and bags of fairy dust. The fun doesn’t stop there though. Interlaced with the glitter-sprinkled pampering we can organise games and dancing, fairy cakes, treasure hunts or anything you can think of! For extra-special parties, the ever-popular chocolate fountain is a great talking point (watch out for messy fingers with this one! ), face painting or even a special appearance from the princess of your choice could go down a treat! One of our favourite ways of interpreting the pamper party idea is a get-together for mums and daughters. This is the perfect way to spend some special time with your girls. Best friends and family could bring their daughters along too for a fun packed party. Invite the professionals in and make the younger girls feel grown up and pampered for the day. Choose treatments such as luxury facials, back massages, make up application and manicures/pedicures. To help set the mood, choose some relaxing background music and wear your dressing gowns! Pamper Me UK can provide these for you. We can’t think of any better way to spend some special time with those closest to you. Use your imagination and set up your party wherever you like; at your home, in your garden, at the local village hall or hotel. Members of the pampering team are all experts in their field and trained to work with children. We know how important it is to ensure all parties are age appropriate, and all products are toxic-free to protect delicate hands and feet. This is especially important if you are hosting a party for other people’s children! You can then reassure them that the party will be safe as well as fun. Next time you are organising a children’s party in Leeds or Yorkshire, visit Pamper Me Girls for our children’s parties in Yorkshire. 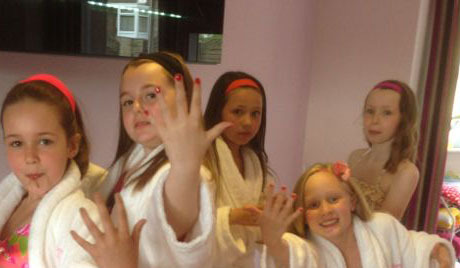 The range of pamper party packages can all be tailored to your needs and the children’s ages. To see all of the pamper party extras, visit our pamper party supplies page. We can supply luxury party bags, girly magazines, chocolate fountains… even a red carpet and throne! Let your imagination run wild with a girls’ pamper party.